Gerhard Kermann brings the bad news to Fritz Kermann. It’s not gut, Fritz. Ze Öl pump ist kaput und ze Kranksheft ist broken in zwo. You cannot fly . In fact, it’s extremely easy to fly! You don’t even need SAS. Replaced the static propellers with spinning ones. They don’t deliver thrust. I didn’t want elevons because they’d distort the dimensions of the plane. 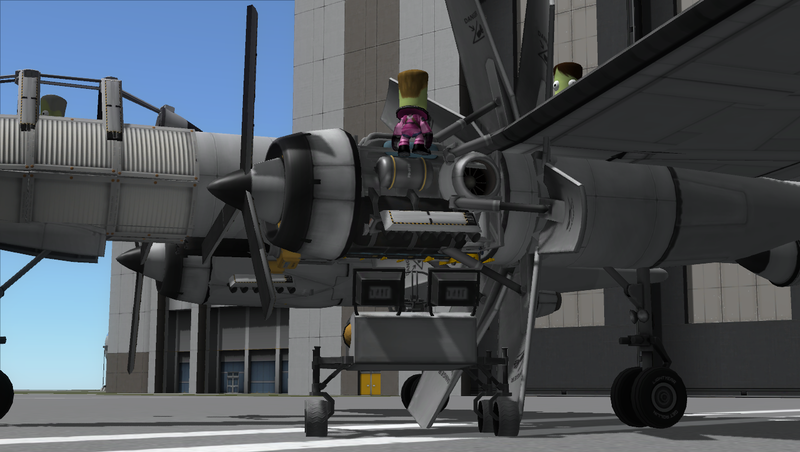 With gratitude to KerbalX user quitessa for his most excellent RCS ball bearing, the best non-wheeled bearing in existence! Replaced the 4 Juno engines with 4 Wheesley’s. Now the top speed is very close to the original (616 km/h). Gave the exhaust stacks a nice smoke effect. Tuning these took a lot of time. I hope you like the result. Best result: 10 - 15% thrust for some nice intermittent smoke somewhat resembling a real engine. Changed wheel grip values, changed the authority of the control surfaces. Trim with ALT+Q all the way. No SAS! Set throttle to 10 - 15%. Start the left engine, action group 1. Start the right engine, action group 2. Set trim to neutral, ALT-x! Enable main engines, action group 3. You can switch the exhaust stack smoke on & off anytime you want, just press 1 and 2 again. Switch focus to the left engine, press 6 and then activate SAS. This will slow down the propeller just enough. Repeat for the right engine but press 7. To prevent the propellers from stopping when going slower than 80m/s, do the following (assuming you used the instructions for regular flight). Change focus to the left engine, press 6 to disable the extra reaction wheel, then switch off SAS. Repeat for the right engine, press 7. Toggle flaps with action group 4. You probably won’t need them. Engine cowlings can be toggled with action groups 9 & 10.